Although the photo I chose to lead off this post isn't a Christmas photo, per se, this Irish cottage certainly displays a festive air with its bright red door and trim against the white stone. Toss in some green grass and trees, and there you go. . . the colors of Christmas. It's too bad we can't see the interior of this particular cottage. Please don't weep, though. I have discovered another cottage with an interior I think you'll enjoy. 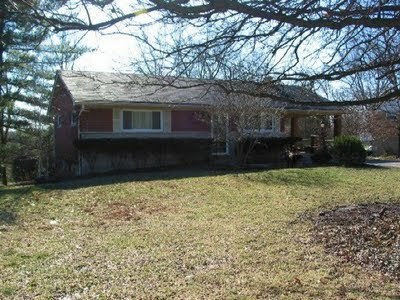 Recently, while searching the web for interesting cottages and decorating, I ran across photos of a charming little cottage in southern Ohio. 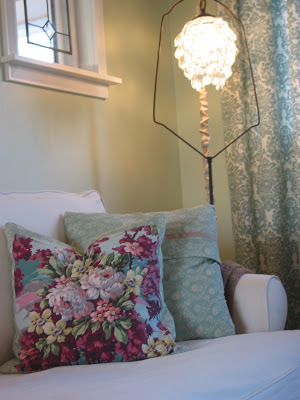 It turns out that Kim the cottage owner blogs at Niesz Vintage Home...and fabric. 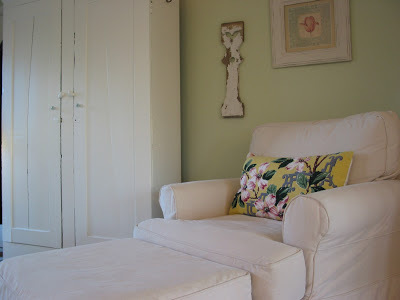 After spending some time perusing her blog I decided her cottage was one I wanted to share with you. 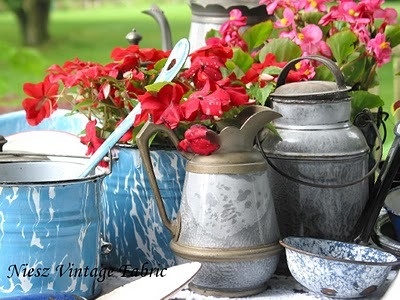 Kim has been great about allowing me to use her photos, as well as providing information about the cottage and her fabulous vintage fabric business. I trust you'll enjoy this post as much as I enjoyed putting it together. The armoire belonged to Kim's grandmother. 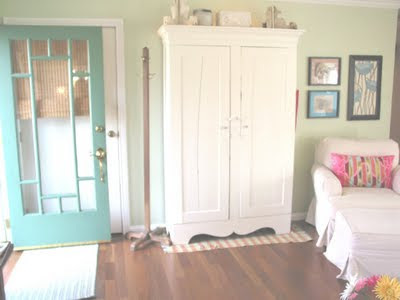 Kim says, "This particular piece was in a corner of [her] attic with a broken door and painted three different colors . . . but I could see it fitting right in at my house. 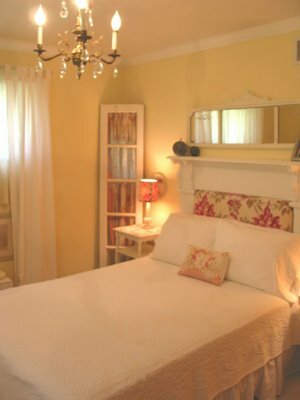 It did eventually receive some additional crown mouldings and a coat of cottage white paint." This 800 sq. 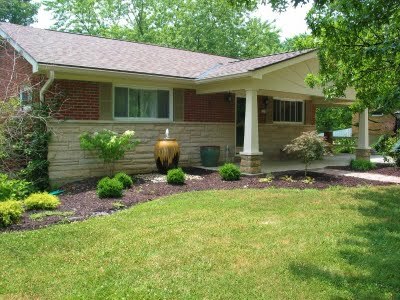 ft. two bedroom cottage began life as a 1960's ranch home. Kim and her husband purchased the house soon after they were married, and lived there 19 years before purchasing a larger home in 2010. 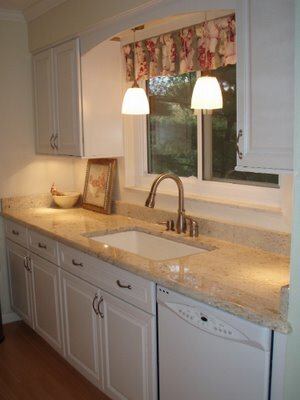 Over the years the couple installed hardwood floors and crown moulding, gutted and remodeled the "tiny" kitchen, and partially finished the basement. 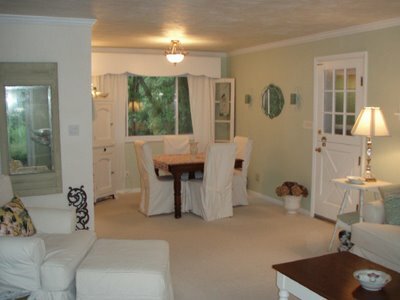 Thus transforming the somewhat ordinary small rancher into a warm and welcoming cottage. Architectural details added by Kim and her husband make the 60's ranch home look like a traditional cottage. 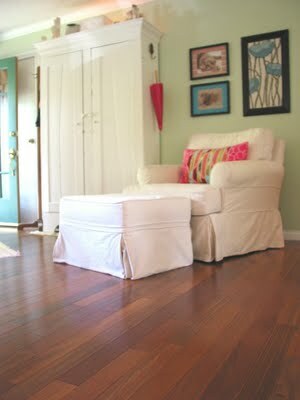 The couple installed new hardwood floors throughout their home, performing all the work themselves. 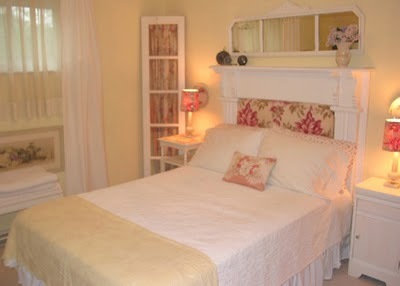 The home is decorated in cottage style with many family heirlooms and vintage fabrics. 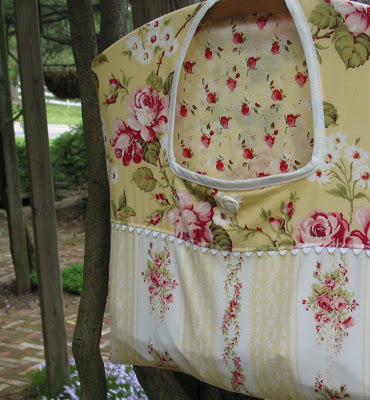 As owner of Niesz Vintage Fabric & Design, Kim has wonderful fabrics from which to choose. 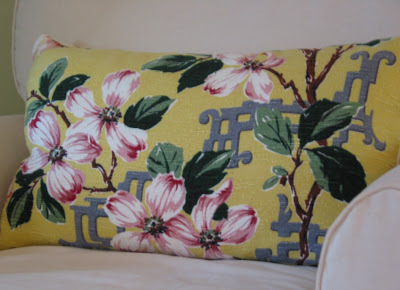 Kim made this beautiful floral pillow from some of her vintage fabric. She changes out her pillows with the seasons or if she just wants a "change of pace". More pillows and drapes Kim made from her vintage fabrics. 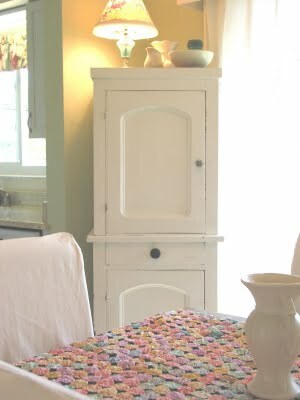 The cupboard in the corner of the dining room is an old kitchen cabinet that houses Kim's cookbooks, wine glasses and serving pieces. An old side-light window fills in a corner to, as Kim explains, "visually balance the small cabinet on the other side of the room." 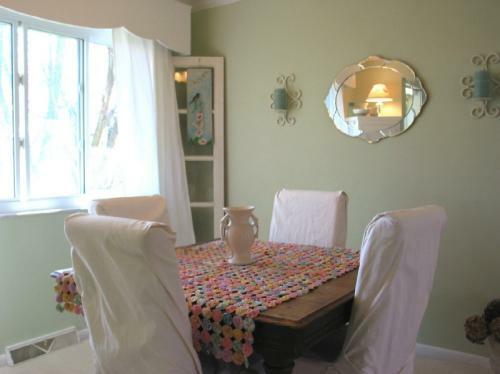 The pretty tablecloth is a quilt made by Kim's mother-in-law from yoyos she found at a yard sale. Kim describes the kitchen makeover as a "long project". But look at the beautiful result. So worth the effort. 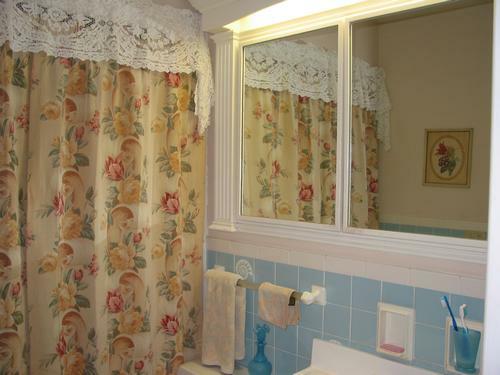 The shower curtain was made from vintage drapes Kim lined with a water resistant fabric. Kim's feminine fabric choices soften the strong architectural details in the bedroom. Another bedroom view shows off Kim's enchanting chandelier. 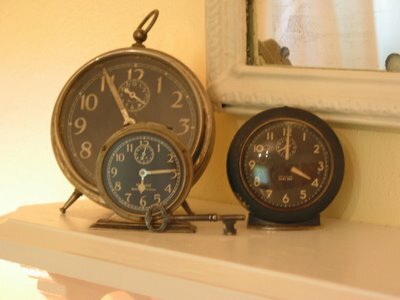 The clocks came from Kim's Grandma's attic. The tiger maple deacon's bench and slag glass bridge lamp both belonged to Kim's grandmother. A touch of shabby chic. 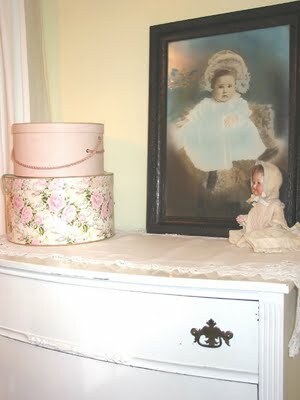 This charming vignette atop the vintage dresser features a baby picture of Kim's "Gram" and a doll from her grandmother's collection. 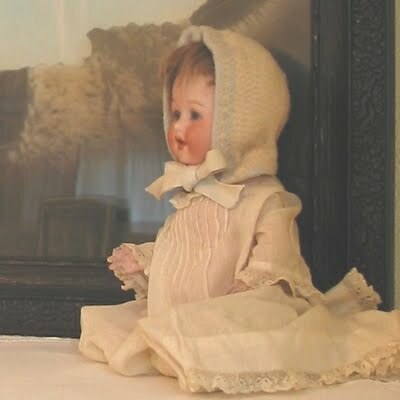 Of the antique bisque baby doll Kim says,"Gram had quite an impressive antique doll collection. Although I'm not really a 'doll person' (even as a kid, their fragile nature made me nervous). I do like this sweet little girl. Thankfully, the majority of that collection is being curated by other family members." I could do an entire post just on the superb heirloom treasures Kim has acquired from her grandmother's attic. I'll share a few more with you. "This cute little piece is from my grandmother. 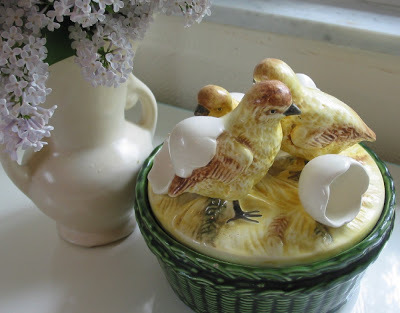 I love the little chicks and eggs so much and it brings back fond memories of grandma's kitchen," Kim says. The condition of her grandmother's graniteware collection is amazing. 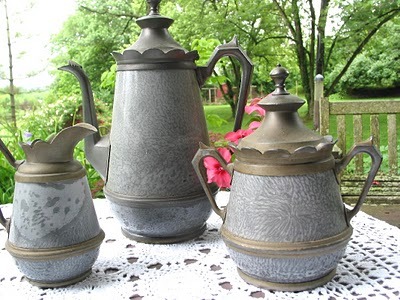 A granite and pewter coffee set. 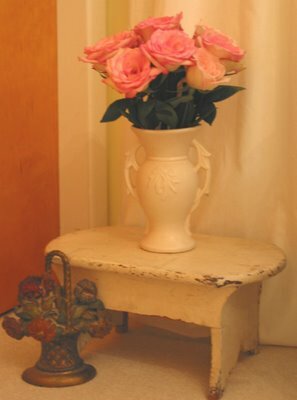 Kim's blogs about her finds in a regular feature called "Treasures from Grandma's Attic". 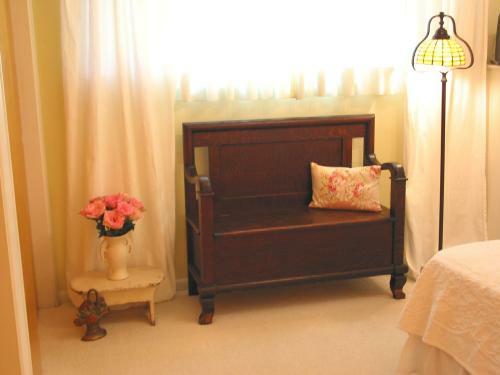 She also shares her many DIY projects, such as the mantel headboard, in "Weekend Projects". About her sweet cottage Kim says, "Although it was a challenge to keep it from looking too cluttered, I really enjoyed decorating the cozy rooms." 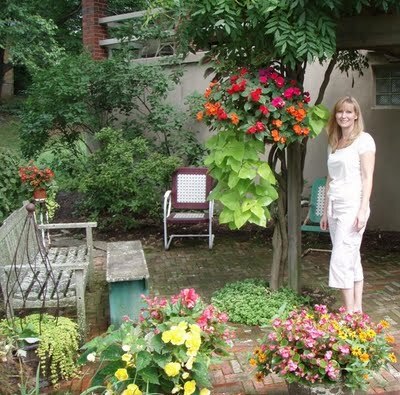 A tour of Kim's cottage wouldn't be complete without a walk through her inviting garden. The lovely Kim on her patio. Kim's hanging baskets are stunning. 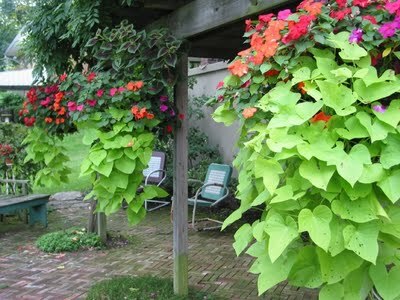 She made them herself by filling moss-lined baskets with chartreuse sweet potato vines, coleus and multi-colored impatiens. 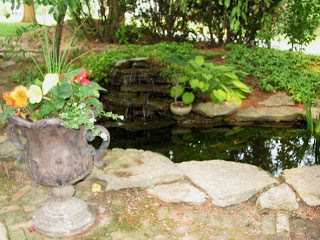 The couple built a brick patio and trellis and installed a small pond off the back of the house. 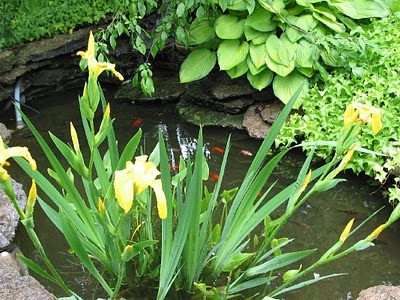 Goldfish swim around a yellow water iris. Kim purchased this delightful clothespin bag on ebay. 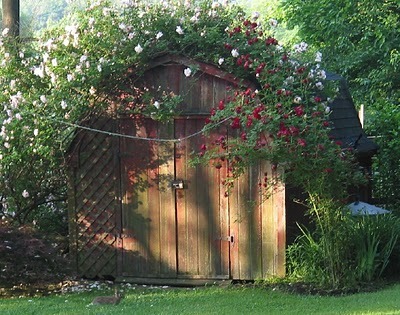 A quaint rose-covered shed gives a homey touch to the backyard. 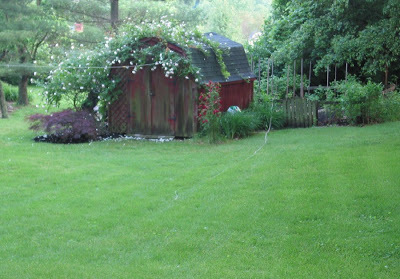 Behind the shed is a vegetable garden. Kim and her husband made an impressive transformation in the front of the house, too. From this. . . They added a front porch and installed a bubbler fountain and new landscaping. 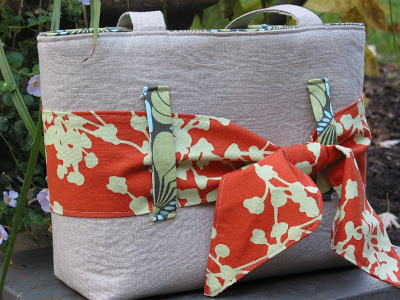 Kim explains how she came to start a vintage fabric and design business. 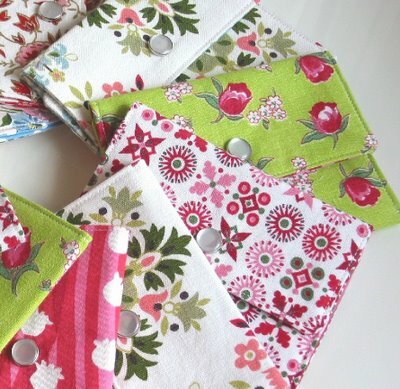 "I've been selling vintage fabrics for about 10 years now. I guess it all started when I found a box of 1940's floral curtains while clearing out my grandma's attic. I wanted to use them for pillows and slip covers, but they were in perfect condition and I couldn't bring myself to cut them up. That's when I started hunting around at flea markets and antique stores for vintage fabrics. I was hooked. It wasn't long before my collection started to outgrow the small second bedroom that I commandeered as my sewing room, so that's when I started selling." 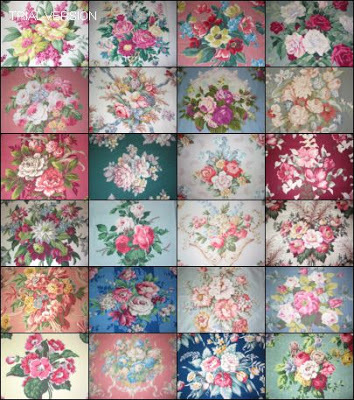 This is only a small sampling of Kim's vintage fabrics. 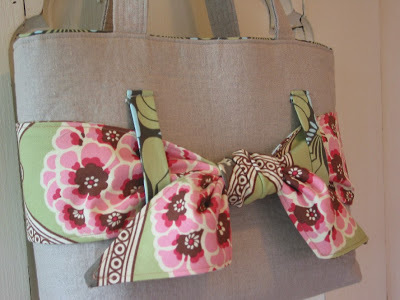 Kim also designs and sews accessories like this fabulous tote with interchangeable sashes. Oh, there's just so much more I could show you, but you really will have to visit Kim's blog to see it all. In one of her blog posts Kim gave her reasons for blogging. "I wanted a place to share pictures of my garden, spark interest in lovely old fabrics, and perhaps, inspire creativity (my own and that of others) with a DIY project. Looking at beautiful photos or making something with my own two hands is mood altering, it makes me feel good. (And much less expensive than a therapist, I would imagine.) 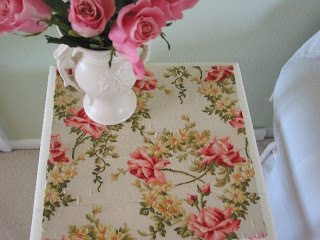 I LOVE seeing all the beautiful home and garden pictures, lovely paper collages, and sewing projects on other blogs, and I can only hope that when others visit my page they feel a little better, too." Kim, all I can say is "mission accomplished." Many thanks for sharing. And thank you, dear friends, for joining me on this little excursion. I hope you feel as inspired as I do. Nancy, I can't thank you enough for the lovely feature and kind words! 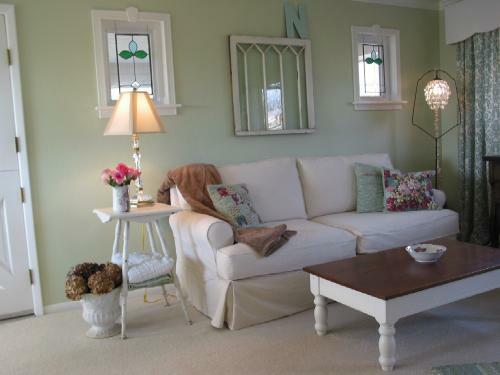 I have always loved the comfort and style of cottage decorating. Thank you for this lovely tour. 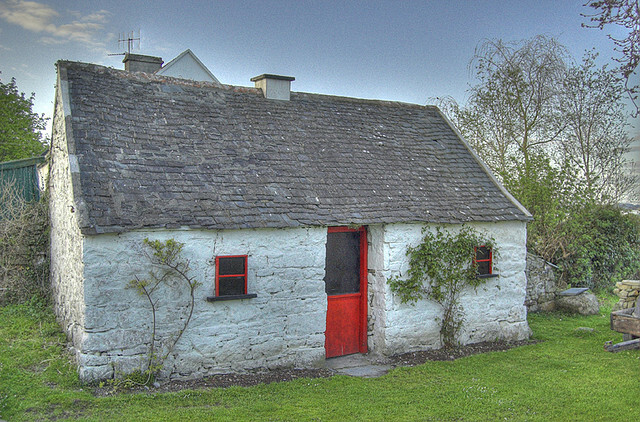 I also like the Irish cottage on the first photo. Thank you for stopping by at Polonica: Home Again. Wishing you a Happy and Peaceful Christmas from Warsaw. Thank you, Zosia, for visiting and commenting. I'm off to see your blog now. Very interested, as my husband is Polish on his mother's side. Merry Christmas to you. This was a good choice to share, every single thing looks fabulous! Thank you very much. I appreciate your comment. Hope you have a merry Christmas. It looks like a fabulous place to spend some time! Merry Christmas to you and yours. Thanks for stopping by. Merry Christmas to you and your family, too. Simply beautiful! Thank you for sharing Nancy. My pleasure, Renee. Thanks for taking the time to visit and comment. Have a great weekend.